The global cap applicators market is prepared for a staggering growth on account of an important force which is expected to be the advent of novel combo machines primed to replace out-of-date equipment. In this regard, companies such as Cozzoli Machine Co. are looking to launch new combination machinery which can perform both the filling and capping jobs while curbing labor cost and also pushing up the production speed. Although the analysts foresee the packaging machinery sector to be highly fragmented, a significant count of players are expected to move toward consolidation with acquisitions and mergers. Vendors of cap applicators are anticipated to be increasingly benefited by the growing trend of affordable, convenient, and on-the-go single-serve containers. 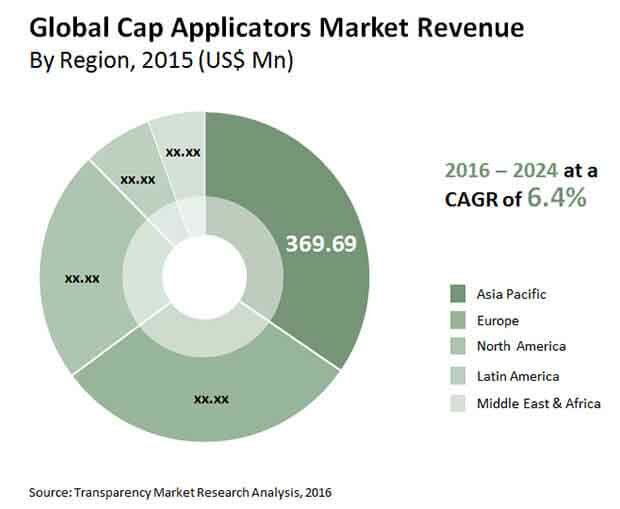 According to a recent report compiled by Transparency Market Research (TMR), the world cap applicators market is prophesied to rake in a US$1,866.7 mn by 2024 at a CAGR of 6.4% for the forecast period 2016–2024. In 2016, the market was worth a US$1,133.8 mn. There is a rising demand for new cap applicators that are able to withstand changes in the designing, configuration, color, and other features of new version caps and closures. Synthetic corks for wine bottles and pumps, tamper-evident aseptic container closures, and flip seal crown caps are some of the newly adopted alternatives of caps and closures. As manufacturers are changing their production styles with altering customer needs and to provide more ease with capping and opening, the want for new cap and closure systems is predicted to augment. The exponential growth in the food and beverage industry could raise the bar for the packaging sector, which in turn is envisaged to stimulate demand in the global cap applicators market. With the regular need for new packaging equipment and development in technology giving birth to combo machines and other novel cap applicator products, the market growth could see a telling rise. Other factors projected to spur growth in the international cap applicators market are the adoption of regulations penned down with the intention of positively impacting growth and acceptance of plastic caps and closures in the packaging domain. The entry of unorganized players in the market could allow the purchase of cap applicators at a comparatively low price. This has also stimulated the demand for refurbished or reused machines which are considered as a cost-effective substitute for the high-budget original equipment. The low replacement rate of cap applicators because of their long-life cycle is foretold raise concerns in the global market as it could result in lower sales volume and profitability. Nevertheless, the effect of these deterrents in the world cap applicators market is prognosticated to be diluted with direct sales opportunities and different modules of packaging machinery. Market players can capitalize on the opportunity of doing away with intermediaries such as retailers and wholesalers so as to optimize their profitability. This could help vendors to stretch their distribution network for effectively marketing their products. Using different cap applicator modules helps manufacturers to perfect cap positions, ensure optimum cleaning, and employ hygienically optimized design equipment. Some of the dominating players in the world cap applicators market are Closure System International, Crowns Holdings Inc., Bosch Packaging Technology, Krones AG, and Tetra Pak.